Using the inside rearview mirror. Using the outside rearview mirror. Using both inside and outside rearview mirrors. Turning your head and looking over your shoulder. You should turn your head to check your blind spots before every lane change. Which of the following commonly causes traffic accidents? Driving too fast for conditions is a major cause of motor vehicle crashes. Being inattentive to surroundings can cause a driver to collide with other vehicles. Most rear-end collisions are caused by drivers following other vehicles too closely. Is less pronounced when consuming beer instead of wine. Is less pronounced when consuming wine instead of beer. Is most pronounced when consuming hard ciders and mixed drinks. Depends on the amount of alcohol in your bloodstream. Consuming any type of alcohol can have negative effects on your reflexes and judgment. It does not matter which type of alcohol is consumed, only how much alcohol has entered a person's bloodstream. 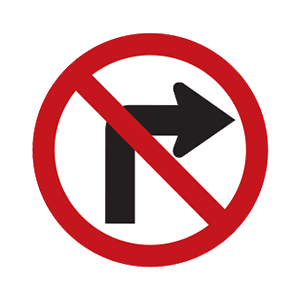 A regulatory sign displaying a red circle with a red slash through the middle indicates that a specific action is prohibited. 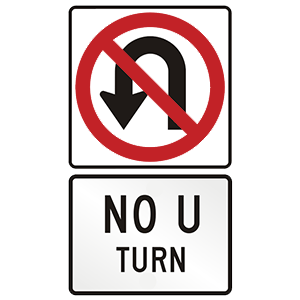 U-turns are not permitted where this sign is posted. Alcohol is the single greatest common factor in fatal motor vehicle crashes. Alcohol is the number one killer on American roadways. Alcohol affects a person’s vision and slows their reaction time, so it takes longer to act in an emergency. Alcohol affects a person’s driving even if they are below the level of illegal intoxication. If the other driver signals for you to re-enter the lane. If you look over your shoulder and see the passed car behind you. If you can see both of the passed vehicle's headlights in your rearview mirror. Before you return to the driving lane when completing a pass, be sure there is a safe gap between your vehicle and the passed vehicle. When you can see both headlights of the vehicle in your rearview mirror, it is safe to return to the driving lane. Make room for the merging traffic, if possible. Assert your right-of-way by driving faster. When traffic permits, you should make room to allow vehicles to merge into your lane.